The response comes after a meeting between Mr Philippe and President Emmanuel Macron. Also present were justice minister Nicole Belloubet, interior minister Christophe Castaner, and his secretary of State, Laurent Nuñez. The government condemned the violence on Saturday March 16 - which included the smashing and burning of shops and restaurants - and said it had nothing to do with peaceful protest. 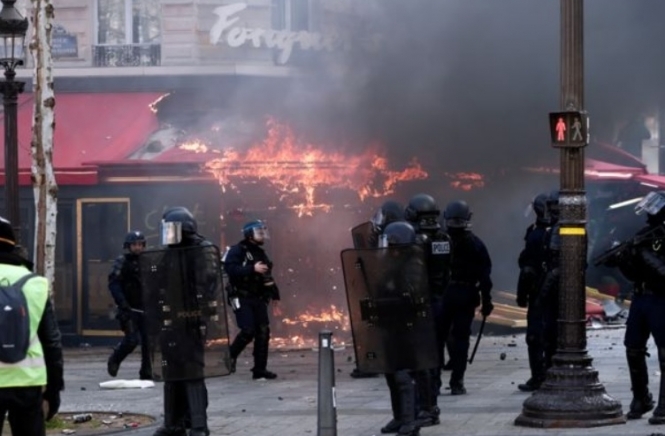 Mayor of Paris Anne Hidalgo said this week that gilets jaunes violence in the capital had already cost the city an estimated €20 million, including €5 million caused last Saturday. French insurance group La Fédération Française de l’Assurance had already estimated the overall insurance costs of damage at €170 million nationwide, not counting March 16. The gilets jaunes unrest took place in central Paris - including on the Champs-Élysées and near the Arc de Triomphe - on the same day as the peaceful “Marche du Siècle” climate change march took place elsewhere in the city, Mr Philippe reminded listeners. The PM has has announced five new measures, which the government says are designed to tackle future unrest. The government will retain the right to ban protests in certain public spaces, in the event that violence and rioting from extremists appears possible or likely. These will include the Champs-Élysées in Paris, Place Pey-Berland in Bordeaux, and Place du Capitole in Toulouse. Mr Philippe has given police officers and law enforcement “more autonomy” to respond to changing situations on the ground, and they will be encouraged to act in a “more unified” manner. The prime minister said that on Saturday, certain police operations had been “dysfunctional” in some areas. Police will be enabled to act as “anti-violence units”, with access to tools of “dispersion and arrest”. They will also be given means to film more of the violence, including through the use of drones. More police vehicles will also be made available to round up anyone who is arrested. All public protests must currently register their estimated size and route with town authorities beforehand, and must receive approval before showing up. Anyone found to be taking part in a protest without prior authorisation will now risk a fine of €135, rather than the current amount of €38. Mr Philippe said that the current system for normal peaceful protest would not change. Mr Philippe confirmed that he had asked the minister for economy and finance to help strengthen the current support package on offer for any businesses damaged by protesters. Michel Delpuech, the former head of police in Paris, has been replaced by Didier Lallement, current head for the Nouvelle-Aquitaine region, and reportedly known for his "even character". The change, which will be confirmed this week (Wednesday March 20), comes after the government recently admitted the “inappropriate use” by certain officers of the controversial defence ball launchers weapon (LBDs). The use of LBDs should be reduced, Mr Philippe said.